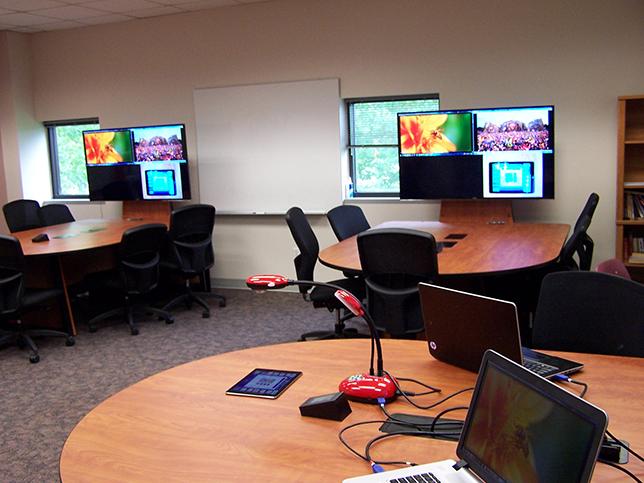 A Texas college is trying out a "drop-in" audiovisual setup in a collaborative classroom. Lone Star College's Tomball campus has added technology from TEKVOX that allows small student groups to work together and share their computer screens. The classroom has four student "huddle pods," each outfitted with the company's 4K Quadview technology, which enables interactive collaboration for up to six participants tiled onto a single display or shifted to a single high-definition resolution. The pods are integrated with a podium. Lone Star College's student "huddle pods"
The system operates in instructor and student mode. The first allows the faculty member to decide what content will be displayed on the large monitor in the room and on student displays. The instructor can also send a particular student pod display to all of the other student displays. Student mode lets a student control operations and work with others by selecting the Quadview mode on the student station touchscreen controller. The college has chosen the new system as the campus standard for technology in its collaborative classrooms. The company refers to its "drop-in" system as a "room solution in a box." The gear is configured, integrated and programmed at the factory, making installation in a pre-wired room quick. "We are very pleased with the result and already have additional rooms scheduled to be installed and more in the planning phase on our six campuses," said Butch Juelg, associate vice chancellor for technology services at the college. "TEKVOX's drop-in solution delivery method makes it very easy to deploy our standard room configurations in a highly cost-effective manner."